Teachers are often encouraged to place mathematics instruction into 'real-world contexts'. However, these contexts do not often relate to students' lived experiences. Math problems ask about spinner probabilities and billiard angles. Even if one plays spinner games or billiards often, these questions do not make sense to ask in their everyday lives. For example, if one plays billiards, and wishes to know how to hit a ball to make it go into a pocket, they need not know the exact angles between the ball, the cue ball, and the pocket. What they need to know is: where do I need this to go, how hard am I hitting this ball, are there any obstructions, where do I want my ball left on the table when I'm done, etc. What is important is the conceptual understanding of what angles do and mean. So, instead of forcing ‘real world’ scenarios into math class, my suggestion is, instead, to find and use the math already in students’ everyday lives. For more on this, see my lesson plans. The mathematical sentence f(x) = -2x + 4 is also represented by the graph shown to the left. However, it is also this sentence: “A diver starts at four feet above sea level. When he dives, he has to dive with the ocean floor, which goes down two feet for every one foot out to sea he goes.” We could use the direction, S27E (approx). We could give two points, (0,4) and (6,-8), or a table of points. We could go on. There’s significant number of ways to ask students to draw this line, and an almost infinite number of ways students could describe this line. Graphing is essentially a translation of modalities among formal mathematical language, ‘real-life’ scenarios, natural language explanations, and pictures. This translation of functions (formal language) and graphs (pictures) is one of the few places in mathematics instruction where “two symbolic systems are used to illuminate each other,” where, usually, the concrete is used to illuminate the abstract. (Leinhardt, Zaslavsky, & Stein, 1990). When we, as readers, visualize a text, we translate words on a page to our concepts of their meanings in our minds and place those meanings into a mental picture of what is going on in the story. So, we take abstract symbols to a concrete idea to an abstract representation when we visualize a text. One of the things dependent readers struggle with is exactly this sort of modality translation we call visualization (Beers, 2003). Being able to explain the differences between modalities, and show how each is useful, is one of the major skills I focus on while teaching, since it is so important to understanding concepts. Because mathematics is a 'foreign' language, it is necessarily embedded within a natural language. However, this embedding makes it difficult for English Language Learners (ELL students) since they are now looking at this class incorporating two different languages, instead of just one. (For more, see Language and Communication: Background). Second (or third, fourth, etc.) 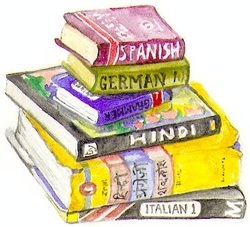 languages often have something in common with a student’s first language. That is, languages have some basic elements similar across all languages. For example, language has something like nouns and something like verbs, even if they don’t function in the same way as Romance languages might manipulate them. (For a challenge to this idea, see “Babel’s Children”). If one’s first language is within a language category, such as the Romance languages, learning a second language within that category might actually be facilitated by the historical roots of such languages. Some words may be the same or similar, and the grammatical structure could offer more parallels than a language not within the first language category of a student. As a teacher, it is my responsibility to help students find these parallels and see how embed their home language within the classroom in constructive ways. It is my philosophy that students learn best when their language is valued, incorporated, and respected. Therefore, I aim to incorporate each of my students' languages within my future classroom. In natural languages, a number acts as an adjective. However, in formal mathematics, a number is an object. In fact, it’s one of the most important objects within mathematics (as either a specification or as a general concept). Importantly, the number does not do the modifying, but, rather, is itself modified (Nesher, 1989). Nesher further elaborates this point by pointing out that mathematical sentences and predicates are necessarily concerned with the truth-value of statements, and that algebra is, essentially, the manipulation of various equivalent truth statements in order to ‘solve’ the statement. In order to do this in the contexts of word problems or ‘real-life’ situations, students must learn how to abstract away from the concrete they use in everyday life in order to understand numbers as what they are within mathematics, and then use these abstract concepts to concretize specific situations. That is, they must go from numbers as predicates to numbers as objects back to numbers as predicates (Nesher & Katriel, 1986). Because this translation takes place on a conceptual level, it is important to make explicit. One of the things I believe it is my responsibility, as a teacher, to do is make instruction explicit and tell my students what is going on in any concept, problem, or situation in the classroom.